Liora Manne Natura Flip Flops Indoor/Outdoor Mat Blue 18"X30", Great Value! 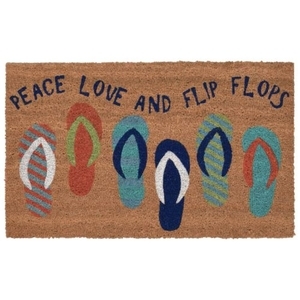 Liora Manne Natura Flip Flops Indoor/Outdoor Mat Blue 18"X30"
Our Flip Flops mat will add a fun, coastal vibe to your doorstep. This coir utility mat is both stylish and practical. Natura coir doormats are durable and beautiful. Crafted from 100% coir which is an all-natural material known for its resistance to the elements. Coir is eco-friendly, made from natural fibers which are extracted from the outer shell of a coconut known for its durability, strength and water absorption. Natura coir mats can withstand all weather conditions and are available in a wide variety of designs ranging from classic, inspirational, nautical and whimsical patterns. Dyes saturate the fibers for vibrant long-lasting color. Liora Manne, designer of cutting-edge rugs, pillows and mats, travels the world in search of inspiration for the hottest trends for decorative home art and decor. Liora Manne Natura Flip Flops Indoor Outdoor Mat Blue Measures 0" by 0"